About 1837, Henry Abington of Henry County, Virginia (1767-1844) moved west to Missouri. The U.S. financial downturn had caused many of the old plantation owners to look west, to the new territory, the young state and its plentiful lands. The young State had come into the Union with the Missouri Compromise of 1821. Slavery was allowed. He and his wife, the former Elizabeth Johnson brought their huge clan, including their sons Henry (1793-1851) and William (1794-1840) and a large amount of family slaves. The family would become one of St. Charles County’s largest slave owning families, and would fight, steal and bicker over them in the St. Charles County courts for years. 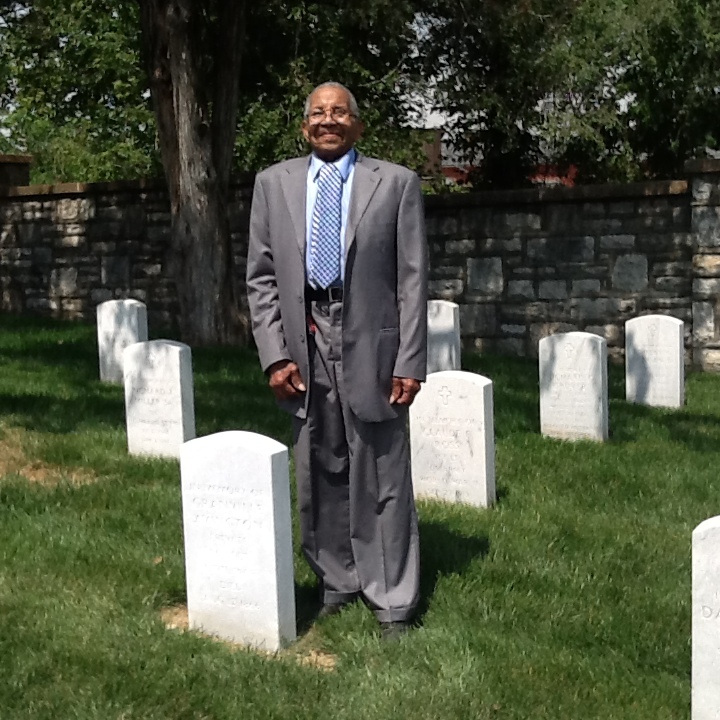 To this day this provides a large amount of legal documents and records that share a story with the Union Army’s 56th Colored Troops and a monument that stands tall today in Jefferson Barracks two hundred years after Granville Abington’s death. When Henry’s oldest son William died in 1840, his widow the former Francis Shelton and their two sons William and Samuel would inherit their father’s fifteen slaves brought from Virginia. In addition to the slaves they inherited from their father, also came a share of inheritance of slaves from Grandpa Henry when he died in 1844, and his ancestors back in Virginia. One of those Abington family slaves was a William J. Abbington. William Abbington was born the son of 53 year old Henry, the incapacitated son of Henry Senior, and a slave named Sally. He was also the grandfather of George Abington. George Abington had asked me to help him find the name of his father Anthony Jerome Abbington’s father. His Grandfather, who had been born and raised in the Abbington household a slave, as all four of George’s grandparents were. He had married Sarah Abbington who was the daughter of Nathanial Abbington. And he had fathered three children before he was murdered in 1878, and Anthony was the youngest. After William’s death, she remarried a Robert Smith, and went on to live a long life. George Abington remembers her well. Sarah had a brother named Granville Abbington [mispelled Avington on his enrollment card] who was a member of the U.S. 56th Colored Troops (Union). In St. Louis in August of 1863, the 3rd Regiment Arkansas Volunteer Infantry was assigned to the Union Army, then dispatched to Helena, Arkanasas where it was re-organized as the 56th United States Colored Infantry, commanded by a German, Col. Carl Bentozoni. He trained the troops for combat, which they saw July 29, 1864. The enemy were concealed in the thick timber and were within 150 yards of us before I opened on them, when they charged with a yell, but being well supported by Captain Brown, of the Sixtieth, with sixteen men, and Captain Patten, of the Fifty-sixth, with twenty-five men, and using canister rapidly and carefully, we repulsed them….During the whole fight the colored men stood up to their duty like veterans, and it was owing to their strong arms and cool heads, backed by fearless daring, alone that I was able to get away either of my guns. They marched eighteen miles at once, fought five hours, against three to one, and were as eager at the end as at the beginning for the fight. Never did men, under such circumstances, show greater pluck or daring.I am, very respectfully, your obedient servant,H. T. CHAPPEL,First Lieutenant. The 56th Colored Regiment losses during service consisted of four officers and 21 enlisted men killed or mortally wounded; and two officers and 647 enlisted men by disease; for a total of 674 fatalities.The vast majority of the deaths due to disease occurred during a cholera epidemic that struck in August 1866. The unit was mustered out of the service on September 15, 1866, and the 56th was traveling aboard 2 steamers to be mustered out. During the trip several soldiers died of an undiagnosed illness. A surgeon inspected the men and reported no cholera among them. The men arrived in St. Louis at night and were kept onboard until the next morning, rather than being allowed to roam the town. The next morning, it was clear that the 56th Regiment had cholera. Ordered back to Quarantine Station, the unit lost 178 enlisted men and one officer in the next few weeks. Granville Abbington was one of those soldiers. 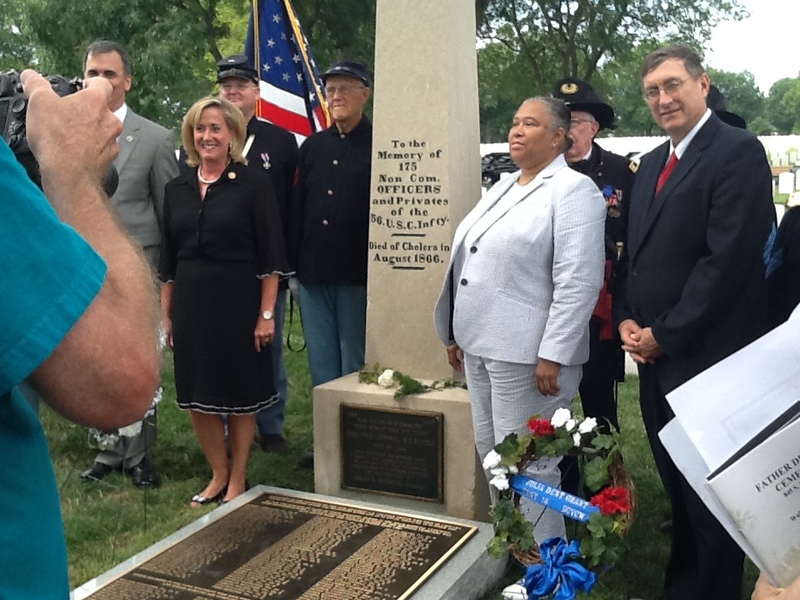 Monument naming the U.S. 56th Colored Troops buried at Jefferson Barracks National Cemetery. the 56th USCT who died of cholera was placed on Quarantine Island where the soldiers had been held. In 1939 the monument and the remains were removed from “Quarantine Station, Missouri” by authority of the War Department, to the Jefferson Barracks National Cemetery. From 1939 to August 2014 that obelisk marked the grave of Granville Abbington, as one of those “unknown” soldiers. George Abbington at the grave of his family ancestor Granville Abbington. 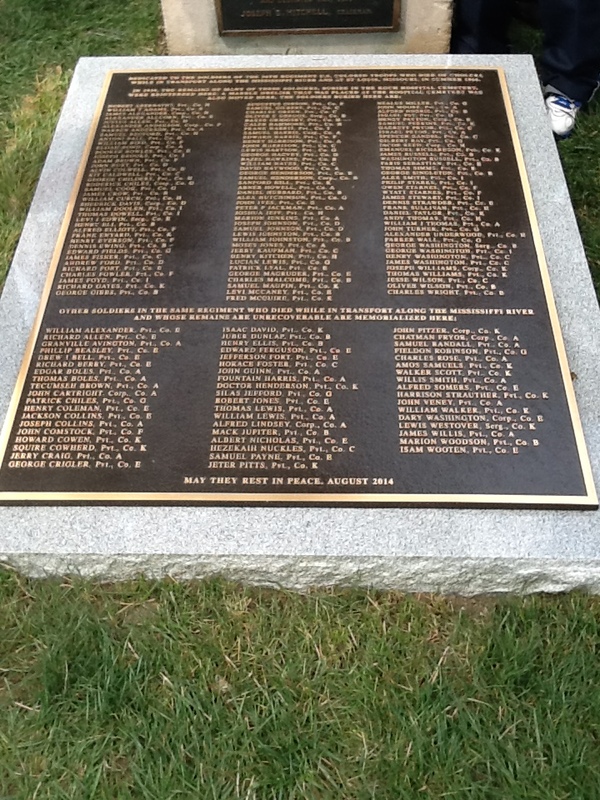 However, the St. Louis African American Genealogical Society was determined to change this, lobbying, and writing, they wanted a monument to list these brave soldiers, listing their names. The U.S. Government would grant this if they could produce proof and a descendant of one of those soldiers known to have died due to the Cholera. Enter George Abbington, who had gone in search of his grandparents and first visited St. Charles County Historical Society’s archivist Dorris Keeven-Franke in 2010. George Abbington’s search into his families past provided enough documentation that in 2014, a new and long overdue monument was placed with the names of the soldiers of the 56th upon the grave formerly marked as “unknown”. And Granville Abbington would finally receive his own memorial headstone.